1 November 2010, at 10:17a.m. BELGIUM - Petersime's new S-line incubators are not only easier to control and programme but also easier to clean. In addition, they have improved temperature distribution and incorporate new energy-saving features. The VIV exhibition in Utrecht proved an ideal event for the presentation of these new models to an international public. For over ten years, Petersime has been successfully supplying the worldwide incubator market with its single-stage AirStreamer technology. The time was right to look at how we could improve the performance of hatcheries and the profit of our customers even more. Petersime tested the latest developments of our proven AirStreamer technology extensively in various industrial hatcheries for more than a year. These tests resulted in the launch of the new S-line, which features two models: the AirStreamerPlus and the BioStreamer. Although the concept of both models is identical, the BioStreamer features additional auto-pilot functions based on the Petersime patented Embryo-Response Incubation technology. 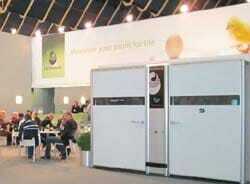 The S-line presentation to the public took place at the VIV Europe exhibition in Utrecht (the Netherlands) last April. Although the number of visitors to the show was far less than expected due to the volcanic ash cloud, the Petersime stand was constantly welcoming interested professionals. Both S-line models were on display at Petersime's 330 square metre stand. Visitor reactions were positive throughout the event. The clean appearance of the machines was complimented, as were the large panoramic windows in the new white door panels. These provide a clear view of the easy-to-clean setter or hatcher cabinet inside. The absence of ducts and false ceilings enables the machines to be cleaned thoroughly. Visitors were also pleasantly surprised to see the controller screen light up when they approached the machine. This Eye-Blink feature shows the overall status of the process time and incubation parameters of the running machine. We also showcased the energy-saving features of our machines, such as the high efficiency motors and the redesigned, maintenance-free turning mechanism. Petersime's new Air Mixing Center was welcomed with great enthusiasm. Air now enters through the centre of the machine and is evenly distributed across the eggs. The resulting optimal temperature distribution leads to perfect uniformity and chick quality. The two new control systems – Iris- Plus and Bio-Iris – were also well received since they enable basic hatchery functions to be operated from the controller keyboard. Programming the machines has never been easier because incubation programs can now be uploaded from the Petersime service web site through the network or via a USB memory stick. The S-line was officially introduced to the press last February. Customers who had ordered AirStreamer machines for delivery after February but before the official launch of our S-line were given a preview of all S-line innovations. They were also given the opportunity to order this new model instead. Much to our delight, almost all customers switched their orders to the S-line incubators, a testament to the quality of our developments. The primary reasons for switching were lower energy consumption, easier maintenance, shorter cleaning times and optimized air distribution. These machines have since been delivered and are now already up and running in numerous hatcheries.